A selection of guns held at the lab of the National Ballistics Intelligence Service. The West Midlands has overtaken London as the gun crime capital of England and Wales according to new crime figures released by government. There were 41 more firearm offences in the region last year than the previous year according to figures from the Office for National Statistics. The annual crime figures recorded 540 West Midlands incidents in 2013/14 compared to 499 in 2012/13. 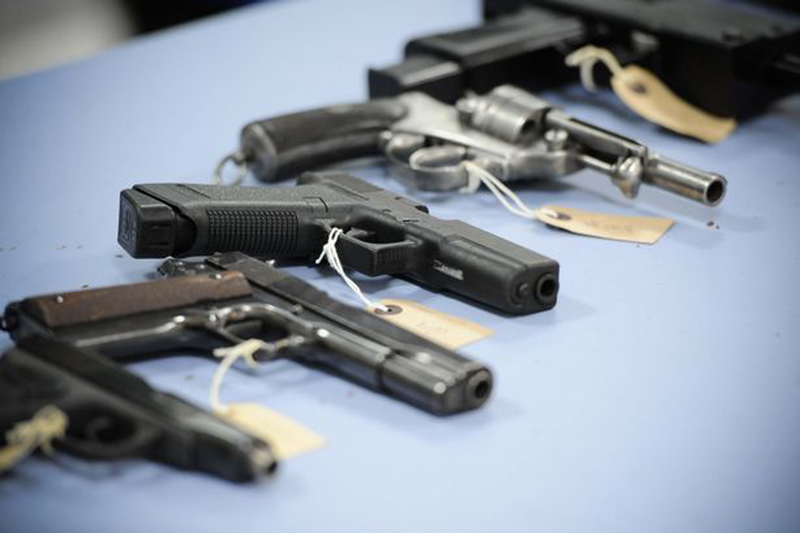 It means that one in nine incidents of gun crime in England and Wales took place in the West Midlands last year, which has a higher gun crime rate for its population size than the Metropolitan Police Service area. The capital's previous figure of nearly 2,000 incidents has dropped by nearly 400 from 23.6 incidents per 100,000 to 19.0 incidents per 100,000 people. The West Midlands, which did have 18.1 incidents per 100,000 people has now overtaken the London figure with a rate of 19.4 - making it the highest of anywhere in England and Wales. Two other major urban areas of Greater Manchester and Merseyside also have lower gun crime rates than the West Midlands at 14.6 and 15.3 per 100,000 respectively. Across England and Wales there has been a five per cent drop in gun crime in the past 12 months and the figures have nearly halved in the West Midlands since 2007/08 when there were 974 incidents. Senior officers described the latest overall statistics as encouraging and showed that firearms are used in a very small proportion of total police recorded crime of 0.2 per cent. Deputy Chief Constable Dave Thompson, ACPO lead for Criminal Use of Firearms, said: "This is encouraging news and we will continue to tackle gun crime in our communities. "The firearms surrenders carried out by police forces last year helped to remove thousands of guns from circulation; weapons which could have fallen into the hands of criminals. "I want to reassure the public that there is a lot of hard work going on to remove the threat of firearms in our towns and cities and we will continue to try and prevent crime as well as lock up offenders." The number of offences involving firearms has been falling year-on-year since its peak in 2003/04 when 24,094 offences were recorded. The latest figure of 7,714 offences represents a fall of more than two-thirds (68 per cent) since then. NABIS, the National Ballistics Intelligence Service, work with police forces across the UK to analyse ballistic material and build up a picture of the threat of gun crime. Head of NABIS, Detective Chief Superintendent Jo Chilton, said: “The decrease in gun crime is good news. "However NABIS will not be complacent on this issue, we will continue to work with forces and law enforcement agencies to reduce the risk posed from firearms to our communities." Nationally, there were 29 fatalities resulting from offences involving firearms in 2013/14; one fewer than the previous year and the lowest figure since 1980. People aged between 15 and 34 also made up a disproportionate number of those of seriously or fatally injured from offences involving firearms (78 per cent of the total, while constituting just 26 per cent of the population as a whole).